Shannon Rookey received a BM in Vocal Performance from Oklahoma City University and an MM in Vocal Performance from Colorado State University. 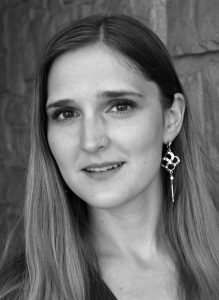 Ms. Rookey is a member of the Praeclara Vocal Company, and she has performed with organizations such as Opera Fort Collins, Opera in the Rock, and the Canterbury Choral Society. Her favorite roles include Despina in Cosi fan tutte, Susanna in Le nozze di Figaro, Valencienne in The Merry Widow, and the soprano soloist in Handel’s Messiah. Currently she is employed as a section leader at Second Presbyterian Church in Little Rock. Her past teachers include Martile Rowland, Larry Keller, and Dr. Tiffany Blake.